The charm of the Lakshadweep Islands is their remote pristine splendour; they attract no merrymakers to their shores. Or, perhaps, it is the beauty of the islands, densely covered with coconut palms, and threaded by an unbroken line of creamy sand, each island serenely set in a sea whose waters range from palest aquamarine and turquoise to deepest sapphire and lapis lazuli. Yet again, it may be that their unique charm lies in the fact that each island, a tiny principality in itself, has existed from time immemorial, with little influence from the outside world. Whatever the reason for Lakshadweep's magic, one fact is certain - it is the island paradise of your dreams. There is silence here, unbroken but for the cry of a seabird, or the sound of the waves lapping the shores. 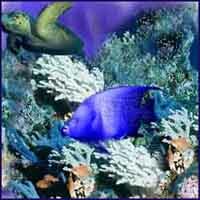 The water is so pristine one can see the myriad different fish among the corals. While snorkelling or deep sea diving, the waters come alive with amazing clarity and colour. Tucked away in the Arabian Sea, off the coast of mainline India, the islands of Lakshadweep retain the culture and ethos of scant few places, still untouched by the madding crowd and the hurried pace of progress. When you visit these islands, take care to leave them untarnished. 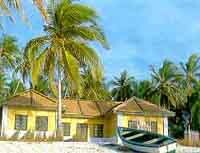 Not much is known of the early history of Lakshadweep. However, enough evidence exists to piece together a history of the islands from the 7th century. The population was converted to Islam under the influence of Hazrat Ubaidullah who set off from Mecca after Prophet Mohammed appeared to him in a dream, commanding him to leave for distant shores to propagate Islam. There was a shipwreck and after drifting on a plank of wood, he reached the island of Amini where his mission met with fierce opposition. After much struggle he was successful in achieving his aim and now the people of Lakshadweep follow Islam. Traces of the old culture still linger. Despite the influence of Islam, a caste system still prevails based on occupation- landowners, sailors and cultivators. Although Madrassas in all the islands impart religious instruction to school going children, many individuals bear two names. 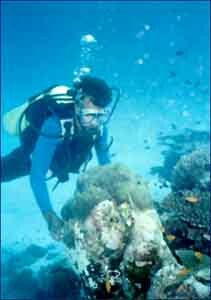 The Lakshadweep archipelago consists of 12 atolls, rich in guano, deposited by centuries of bird droppings, 3 reefs and 5 submerged banks. There are 10 inhabited and 17 uninhabited islands, 220 to 440 km west of the Kerala coast, in the Arabian sea. Minicoy, the southernmost island is 183 km from Kalpeni, its nearest neighbour. Androth, the eastern most island is nearest to the mainland. The islands are a northern extension of the Maldives chain and are formed of coral rocks surrounded by semi-circular lagoons. Most islands are just 4-5 m above sea level. Climatic conditions are similar to that of Kerala coast. Average rainfall is 1600 mm a year with a major share received from the southwest monsoon. They experience a tropical climate with temperature ranging from 25 degrees C to 35 degrees C and humidity ranging from 70 -76 per cent for most of the year. March to May is the hottest period of the year. Ethnically the people of the islands are similar to the population of Kerala. Even the language is the same except in Minicoy where Mahl is spoken. They follow conservative customs and traditions but are liberal in approach. The people are friendly and honest and there is an absence of crime. Testimony to this is the profusion of gold ornaments worn by the women. Young children are spotted wandering alone wearing chunky jewellery. 93% of the population is indigenous. According to the 1991 census, the population was 51,707. History comes alive in folk ballads that women chant during household chores. Memories of the past - the arrival of Hazrat Ubaidulla in Lakshadweep, the plunder of the islands by the Portuguese, are kept alive by the balladeer. The men have spirited folk dances. Women are modest and dress colourfully. In Minicoy there is a profusion of colour, on houses, furniture and boats. There are many seamen from Minicoy on merchant ships all over the world. Lakshadweep has a simple economy but it is not a closed one. Wealth is still assessed by the number of coconut trees one owns. Coconut is cultivated in every available space. The annual yield of nuts is approximately 26.5 million. The fishing industry is the other major source of income. The annual fish landing crossed the level of 10,000 MTs a few years ago. There are subsidiary industries based on coconut and fishery. Boat building was once an important skill that may soon be lost with the advent of motorized boats. Majestic wooden boats anchored along the shore stand in silent testimony to the past. Boats were built differently, according to function and every island has a slight variation in design. While sighting a boat one could deduce the island it came from. Tourism in these islands is restricted to minimise damage to the environment. As a tourist one can indulge in adventure sports such as scuba and snorkelling or simply commune with nature in virtual solitude on a holiday that will be different from any other you've even enjoyed. There are Govt. organised package tours of the islands where one can stay on board ship during the travel. Only four islands have opened for domestic tourism and one, Bangaram, has been opened to International Tourism. The administrative capital, Kavaratti is the most developed with the highest proportion of non-islanders residing. 52 mosques are spread all over, the most beautiful being the Ujra mosque. A well at this mosque is believed to contain water with curative powers. The mosque has an ornately carved ceiling, carved from a piece of driftwood. Kavaratti also has an aquarium displaying several species of fish. There are glass-bottomed boats for viewing marine life and an array of remarkable coral formations that provides a background to the lagoon. Water Sports like kayaking canoeing and snorkelling are available for tourists. Furthest from Kavaratti island, 200 km. away to the south and nearer to the Maldives, Minicoy displays a lighthouse built by the British in 1885. Visitors are allowed to the very top. 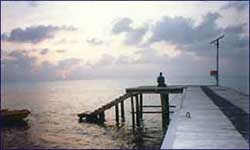 The lagoon is one of the largest in Lakshadweep. The green of coconut trees and the mirror-like surface of an inland lake as it nestles in one corner of the island provide an immensely beautiful seascape. Minicoy possesses a culture very different from the other islands - in dress, language and food. There is a cluster of 10 villages, called Athiris, each presided over by a Moopan. A walk through the winding lanes of the villages can be culturally rewarding. Minicoy is renowned for its dance tradition: the lava dance is performed on festive occasions. There is a Tuna canning factory. Tourists can stay in privately managed cottages. The island is open to foreign tourists and has an exotic tourist resort. Tear-drop shaped, it is encircled by a halo of creamy sand. Like the other islands luxuriant plantations of coconut provide coolness even during the hottest part of the day. There are three uninhabited islands in the same atoll consisting of Tinnakara, Parali-I, Parali-II. These are easily accessible by outboarding, sailing rowing and, for the adventurous, by kayaking or wind-surfing. All the islands share the same lagoon, an enormous bowl of turquoise blue. At twilight, the setting sun, a ball of crimson in a flaming sky, casts its reflection on the water and with the coconut palms as a black silhouette, Bangaram is simply alluring. 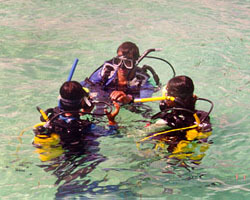 The warm, clear, deep waters of the Indian Ocean are an irresistible invitation to the scuba diving fraternity. The exquisite coral formations include black coral formations. There is a large variety of coral fish-angel, clown, butterfly, surgeon, groupers, turtles, not to mention the abundance of adrenaline generating sharks, manta rays, sting rays and moray eels. Diving here is an addictive experience, and any diver will be proud to display the stamp of dives at Bangaram. The philosophy is to preserve marine life in its original state of purity, where coral and the shell and marine life are left undisturbed. The Bangaram Island Resort is fast becoming a "must do" among the island hoppers of the world.